If you attend my prenatal yoga classes you learn a simple hula to accompany Ra Ma Da Sa Sa Say So Hung, a chant of healing and loving-kindness. My intent is not to create a new and trendy lineage of yoga but to share a tool that can cultivate open-hearted presence, encourage optimal baby positioning, and enhance the flow of endorphins. In my personal practice yoga and hula are intimately intertwined, as they are integral aspects of my svadharma, of my kuleana. Here’s a peek into my journey to hula. Kumu Patrick, our hula teacher, asks us to adorn the border of our skirts in preparation for our first performance. The imagery must be Hawaiian and must also reflect meaningful aspects of our personal journey. A single idea explodes into several pages of sketches drawn at our dining room table. I am compelled to share the story of how I was first called to hula to the present. It would be reasonable to assume that the journey from Point A to Point B is a short one — call hula school and register. But my path to hula isn’t so simple. The Universe has other plans for me. Sixteen years elapse before I don my first pā’ū and attempt my first kāholo. What could possibly delay this journey nearly two decades? And for what reasons? Only in hindsight am I able to see clearly and to know without question. Ocean waves come ashore along the back edge of my pā’ū. As expressed in the Kumulipo, a Hawaiian nature chant, the ocean sets the stage for the beginnings of every thing and every one, including this story. While I have lived other places, San Francisco feels like home. I was born here, and its unique energy impresses upon me more like a beloved person than an ordinary place. Imagine my surprise and pure delight as I watch a hula danced to Tony Bennett’s “I Left My Heart in San Francisco”. Sprinkled between Julia Child, Jaques Pépin, and shows recorded at The Culinary Institute of America is a commercial for a local bank, an ad which barely mentions the bank and focuses entirely on women in red, floral dresses swaying gracefully beside familiar vistas. Delicate hands trace the curves of our iconic hills and express the inevitability of our return when we leave. With one hand on one hip, the other hand rises up and pulls down, clanging an invisible cable car bell. I know nothing about hula at this point. But I do know, beyond logical thought and in every cell of my body, this is special. 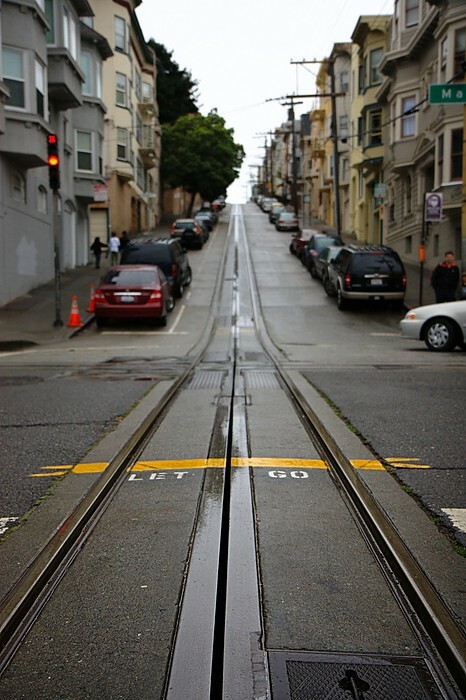 Cable car tracks set into a stylized hill commemorate this moment. In an era of phone books and answering machines, I choose a handful of hula schools and leave a message for each, figuratively blowing into this conch shell and requesting entry. But none of them return my call. While my calls to begin hula go unanswered, potential suitors respond. A plunge into the depths of the digital dating realm proves worthwhile when this turtle, an impressive online navigator and kind soul, finds his way to me. Courtship blossoms into marriage. These unfurling ferns, symbolizing love, harmony, and new beginnings, represent our commitment to life partnership and the joining of my husband’s family with mine. While some artists may associate these ferns with Hawaiian culture, its origins are rooted in Māori culture and the people of New Zealand who migrated from Hawaii and various islands within Polynesia. My husband and I marry with the intention of having children, but we do not anticipate the upheaval that comes with this pregnancy. Unconsciously maintaining the status quo no longer resonates. With our daughter in my womb, I awaken to see the world as I have never seen it before. I learn about women who tapped deeply into their bodies and into their ancestral knowing, about the completely healthy, physiological state of pregnancy and how best to support gestation and birth. Although the information is unfamiliar to me, it is a homecoming — a return to a place I have no recollection of leaving. But it doesn’t stop here. From this point forward, I allow two questions to surface. They tumble continuously over each other as I navigate all aspects of life. Why is the C-section rate so high? Why is the breastfeeding rate so low? Why are babies fed rice cereal as a first food? Why do free play and self-directed projects often cease after preschool? Why is formal education important? Why do some life partnerships continue to grow and strengthen while others atrophy and often lead to dissolution? Why am I here on this planet, in this body? How do I answer these questions in ways that resonate with the truest parts of me and also cultivate connection and well-being? Our daughter becomes one of my greatest teachers, inviting me to grow, trust, and heal. More informed about fertility, pregnancy, childbirth, and child development, I approach the conception of our second child with added enthusiasm and confidence. This exuberance is put to the test, however, with each passing month and the sight of menstrual blood. Frustration, envy, and grief ride in as unwanted guests. Rather than seek the assistance of others, I choose to look inside myself. What needs to be released? What needs to be healed? I identify a complicated weight I have been carrying for several years, a pull-the-rug-from-under-me emotional trauma. The messy mix of anger, loss, betrayal, and abandonment set up camp in my body, and this unexpected pause in our plans arrives as the invitation to let it go. Through exploration and reflection, l soften the scar tissue around the wound and begin dissolving the wound itself until compassion and forgiveness take its place. I understand, intuitively, that new growth of any kind is less likely if I desperately hold on to what no longer exists. I accept destruction and death as part of the process of birth, much like the ‘ōhi’a lehua flower embraces seemingly impossible circumstances to blossom and then thrive in the wake of a lava flow. A vacation in Maui with extended family is a welcome diversion, although the shadow of trying to conceive ever-present. Erratic bleeding throws me off center. I don’t know what to believe or what my body is trying to tell me. I share a quiet moment with a fertility tiki in Lahaina and leave an offering of flowers. Then, a glint of hope, one of candle flames quivering on the edge of becoming smoke. I am pregnant, but the healthful gestation of our son appears discouraging and, at times, unlikely. Unexplained bleeding and a potential complication become part of our reality. I dig deep, drawing upon every emotional and spiritual tool I have cultivated since my first pregnancy. Our son does eventually join us earthside and with an entrance to test my resolve. He emerges healthful and vibrant. We come to know him as playful, sweet, and affectionate. As I contemplate an image to capture our son’s bright and energetic spirit I lean towards choosing a dolphin, but he craftily negotiates with me until I agree to paint a whale to match the mama and calf I paint to represent his sister’s gestation and birth. Our son and I are out exploring the city one day, and I notice a large ad on the side of a bus. What draws me in initially is its uncluttered composition — two women set against a solid background, their eyes and smiles beckoning something or someone in the distance. “Hula Show,” it says in large, white letters. I purchase two tickets and attend the family show with our daughter. Part way through the performance the emcee invites the audience to stand, and he guides us through a basic hula step. This show is entitled “Ka Leo Kānaka” (The Voice of the People) and features the rich culture and history found within the pages of Hawaiian-language newspapers. At the time of this production a single plume stands as the centerpiece of the hālau’s logo. Immediately after the show I pull up the school’s website on my computer and discover that open enrollment for beginning hula classes is closed. The next round will open in 2 to 3 years. I e-mail a message of interest to Aunty Bobbie and wait. I read the description for an upcoming workshop, and thinking comes to an abrupt halt. My body takes over. In the space between the bottom of my heart and the top of my stomach a fist-sized mass of energy forms like a solid weight. Up shoots a clenching in my throat, a flare in my nostrils, a furrow in my brow. Then nothing, as I shove it all down hard. But I can’t keep it down for long. As my husband empties plates from the dishwasher that evening I tell him about the workshop, and before I know what’s happening I’m sobbing. I utter nearly-unintelligible words through a rush of tears, all-the-while completely confused by the split between my mind and some yet untapped place beneath my heart. With my husband’s encouragement, I release the need to rationalize why I must attend a weekend writing retreat and travel away from my family for the first time. I embrace the opportunity to explore the epic cliffs of Esalen and to uncover the gifts writing can offer. The jewels I unearth? Too many to count within the context of this little story. But a stranger does look at me from across the room and says I need to become a yoga teacher. Nothing quite like a stranger holding up a mirror to an idea secreted inside me, an idea I had intentionally buried beyond sight. I return from Esalen renewed and eager to begin yoga teacher training. Up until my studies, pregnancy had been the only times my body craved yoga practice. But as my understanding of its philosophy deepens and my understanding of its effect on well-being refines, I turn to yoga as a personal tool and as one way of supporting others in their journeys. 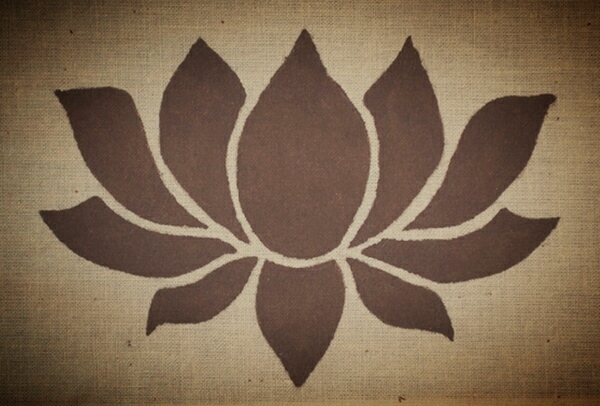 Like the lotus blossom I can choose to open myself each day, each moment, and with each breath, transcending murky waters to dissolve the illusion of separation and to allow love to light our way. The week after I graduate from yoga teacher training I receive an e-mail from Aunty Bobbie welcoming me to hālau hula, Nā Lei Hulu I Ka Wēkiu (the many feathered wreaths at the summit held in high esteem). I don’t know exactly how I know this. No one mentions anything about this dance during class, and I don’t exchange words beyond a simple aloha with anyone. My intellect scrambles to catch up with my intuition. A quick internet search confirms what my body already knows. I am finally ready, and my kumu has appeared. This kalo leaf, this sacred and beloved plant in Hawaiian culture, stands nearly 8 inches tall at the center of my pā’ū and mindfully dips below the hem line to underscore its importance. My kuleana (my calling, my reason for being on this planet and in this body) is to soften and release the protective walls I have built around my heart. This leaf’s bright veins represent the love and light pouring out of the very essence of my being. Eighteen years ago my heart was not soft enough or open enough to receive hula’s blessings. I had yet to uncover the power of allowing myself to be vulnerable. I had yet to comprehend the value of truly seeing and being seen. Only after partnering with my husband, gestating, birthing, and parenting two children, healing emotional wounds, cultivating rituals of self-care, nurturing forms of expression, and co-creating community am I finally prepared to give and receive in the unique ways hula asks of me. Ha’ina ‘ia mai ka puana. The story is told.